The screenshot above is a very normal new member profile. I’ve written in the past about the advantages of a fully filled out Meetup.com profile in the bigger picture, but I also want to stress the very basic SEO advantages. First stop is to include your entire name. The truth is, people want to connect with people at this Meetup. Giving people at least your name is a way to make yourself more approachable. 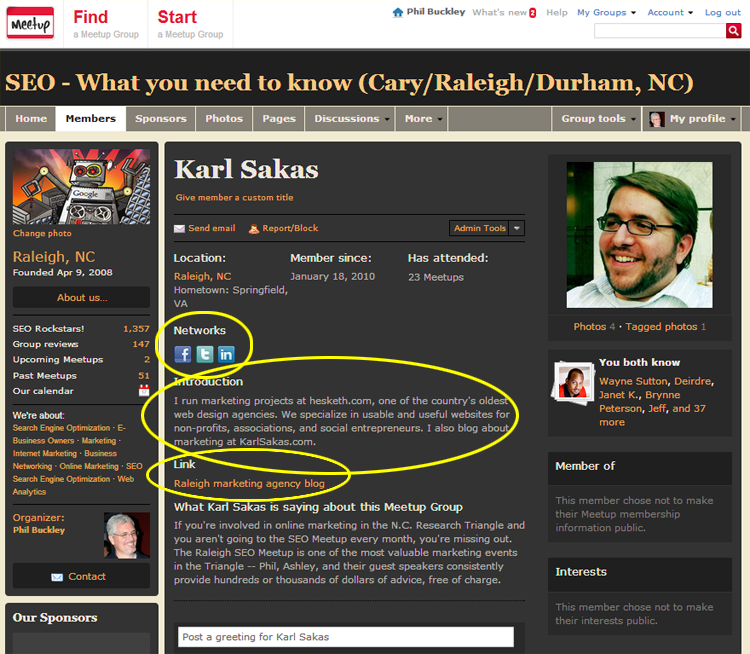 When it comes to doing personal branding in a smart way, you can always check in with Karl Sakas. Karl’s profile takes advantage of the three biggest opportunities. Karl takes advantage of adding his Facebook, Twitter and LinkedIn accounts so that people can find him easily on his preferred social networks. He also took the time to write-up a paragraph so that you know a bit about him and what he does for a living. Finally is the best part of your Meetup.com profile – a fairly powerful backlink where you get to choose the url and the anchor text! Karl was smart enough to use descriptive anchor text to link back to his popular marketing blog. Since getting high quality backlinks are still the fastest way to improve your placement in the SERPs It’s amazing at how often our members miss this super easy backlink opportunity. For anyone looking for a job or looking to connect with customers take full advantage of the branding opportunity that this profile affords you. 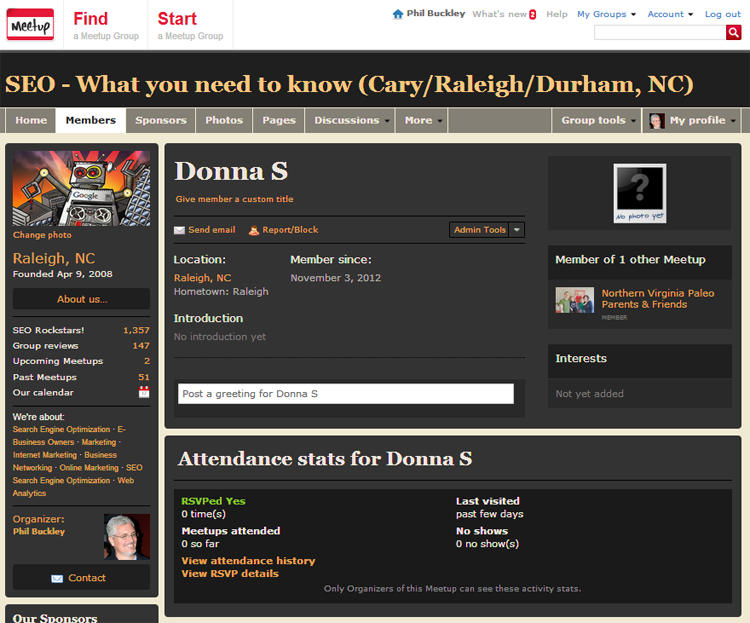 If you are a member of the Raleigh SEO Meetup – go update your profile! Phil, thanks for the shoutout! As soon as you mentioned the benefits to using custom anchor text in online profiles, I updated my Meetup.com and LinkedIn profiles accordingly. Guilty, partly because i hate meetup. i actually deleted my profile a few years ago and restarted one over the summer because there were 2 groups i really wanted to join, one of them being yours. I HAD a link there but it looks like Meetup have removed that functionality now. Have you noticed, or am I missing something? Yup, it looks like Meetup removed it. You can still put a link in your other places within your profile, but it’s not quite as cool as it was before. Hi Phil, thanks for the tip, I managed to add one to my introduction, albeit with an elipsis. I have been trying to add a link in my introduction but I can’t figure out the html code. I would appreciate your assistance.